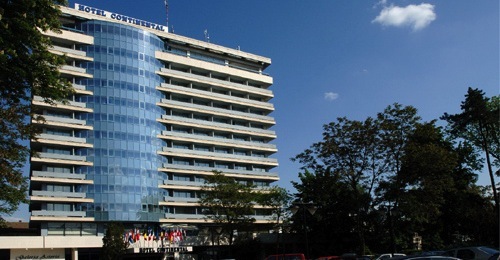 Drupalcamp Arad 2012 will be held at Continental Forum Hotel, in the nice panorama hall situated on the top floor. The hotel is located right in the heart of the city being easy to access from all directions. Web is evolving and Drupal evolves too. After launching the release 7, the community is working for the next big step: making Drupal a better product in the new world of webservices, mobile and HTML5 standards. This are few of the topics we plan to cover at the conference with focus on Drupal & Government (OpenSource for OpenGovernment), Drupal for Education (eLearning), Business/Enterprise and Drupal for NGOs. Arad railway station is an important connection point for many European rail destinations. International sleeper trains arrive in Arad from Venice, Vienna, Budapest, Prague, Bratislava, Belgrade and Sofia. Train travel is generally slower than bus travel. See CFR for domestic trains and DB Bahn website for international train timetables and fares. Arad is a charming city situated in central-eastern Europe, with quite easy access from everywhere in the world, due to the 2 international airports nearby (Arad airport, 5 km from city center and Timisoara airport, 58 km from city center), with many flight connections (both low cost and line airlines), and a key position in a cross point of important European roads and rail connections. Getting there: by plane, by car, by train. Are you a non-EU citizen? Learn how you can enter Romania. Welcome to Arad, dear visitor! Anyone could say ”Welcome!”, but when one is in Arad one is truly, deeply, madly welcome, so... WELCOME to ARAD!